Anyone that followed the Miami Food Truck Scene in South Florida from the beginning (late 2009) knows of the Yellow Submarine. They were the 3rd truck to hit Miami and really made me look differently at the Colombian Style Street Food they were serving. I was tired of all the frozen patty and recycled sauces all those joints were using. The Yellow Submarine Burgers & Hot Dogs had better versions of those similar sauces and behind them was a great Burger or Hot Dog that could stand alone, no toppings necessary. It was both a sad and great moment for them when they retired their Truck and were committed to opening Rock That Burger in Kendall. They were gone for close to a year. If you’re wondering what happened to the truck, the former Yellow Submarine is now Mushaboom, a Vegan Burger Truck. I visited a couple of times when they first opened Rock That Burger back in August but was just not sold on it. It didn’t seem to be the same, there was something off. I figured I’d give a few months and hope that they had found their groove. My wife was always a giant fan of their Killer Queen Sandwich which was not on the original Rock That Burger menu. It was great to see it on the Specials board when we walked in. We started with the Cheese Fries. These guys were the standard Fries topped with Cheese. You could also add Chili too but I’d like to see the Yellow Submarine Fries with the Pineapple and House-made Tomato Sauces make the menu. I’m sure they’d make them for anyone who asks but some folks don’t even know about it so maybe it’s like a “Secret Menu” item. Back in the day, the Killer Queen came in long Sub style bread but because of the strip mall, they’re in it’s not possible (there’s one of those chain sub shops). The K-Queen is a Chicken Sandwich but with Buffalo Chicken Cold Cuts instead of the usual slab of Chicken. It’s topped with Mozzarella Cheese, Lettuce, Tomato, Onions, Garlic Mayo, & Pesto Sauce. Whoever came out up with this combination of flavors deserves a day named after them. Rock That Burger allows you to create your own Burger with over 15 options but the Yellow Submarine named after their former life is the one to get. It normally brings Lettuce, Tomato, and Onion but I ixnayed those. 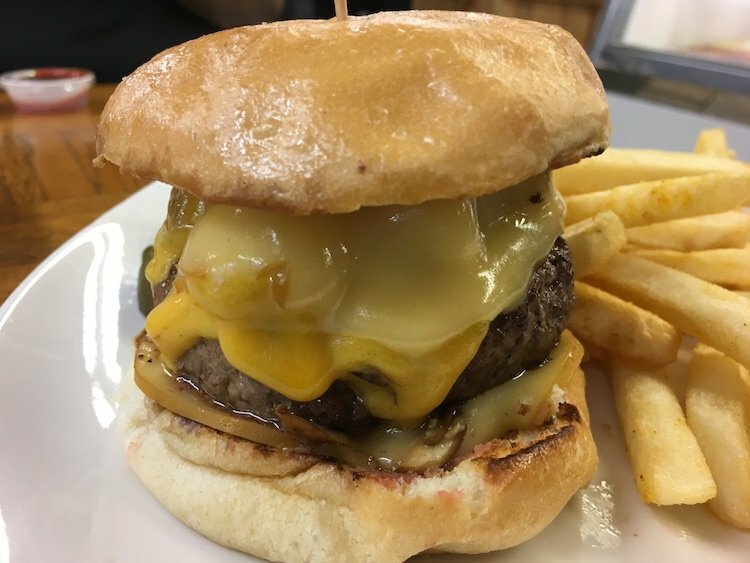 My Yellow Submarine Burger was topped with Mozzarella Cheese, House-made Tomato Sauce, House-made Mustard, Pineapple Sauce, and Crushed Potato Chips. The Burger is a well-seasoned patty with the spices mixed into the beef. Another great flavor overload. There are people who will tell you to go to Chicago or New York for the Best Hot Dog you’ll ever have. I’m telling you that the Paradise City Hot Dog (formerly the Yellow Dog) is one of if not the Best Hot Dog I’ve ever had. The All Beef Hot Dog is sliced and cooked face down on the flat top to get a nice crispy exterior. The toppings are the same as the Yellow Submarine Burger. It’s the real deal.